owlet: So you think you're sustainable? So it was with some enthusiasm that we welcomed the news that we were finalists in the challenge. We won some awesome prizes to get us started and we're in the running for some pretty impressive window sash treatment for our old 1950's nest. Mostly we're just grateful for the motivation to get started doing something and the owlets are super pumped too! When the energy assessors came to visit, and we understood what was in store for us, we figured the extra challenge here was that we were already living pretty sustainably. All our food was composted or fed to the chooks. We were pretty conscious about things. Surely there couldn't be much more we could do that would make a difference, could there? We knew we'd slackened off a bit, but we'd have to work extremely hard. So we set out to see. We timed our showers and were surprised at just how many minutes (and litres!) we lost while daydreaming. On average 8 minutes, but up to 18, which translates to 180 litres in our shower. That's a whole lot of water going down the drain. We kept a rough food diary, which reflected how hurried our days had been and how convenience played a part in our consumption. We tallied all the waste we produced, both rubbish and recycling, and although people have told us the amount seems small to them for a family of five, to us it is far too much for one planet to consume, week after week. Don't you agree? We'll be blogging and instagraming our findings and reflections over the next couple of weeks, as we find a way to make this work, not just for two weeks, but for life. We've got some pretty big goals and we'll be tackling things like reducing our energy consumption, producing zero waste, family cloth, composting, animal poo worm farms, using less water, and grey water. There's always room for improvement! If you'd like to join the challenge, you can find it here. If you're in Tassie, you can take your challenge worksheet along to the Sustainable Living Festival and enter into the draw to win a solar hot water system - what we wouldn't give for one of those! Let us know how you go! We have been living waste free (besides some recycled items) for a 3 years now. 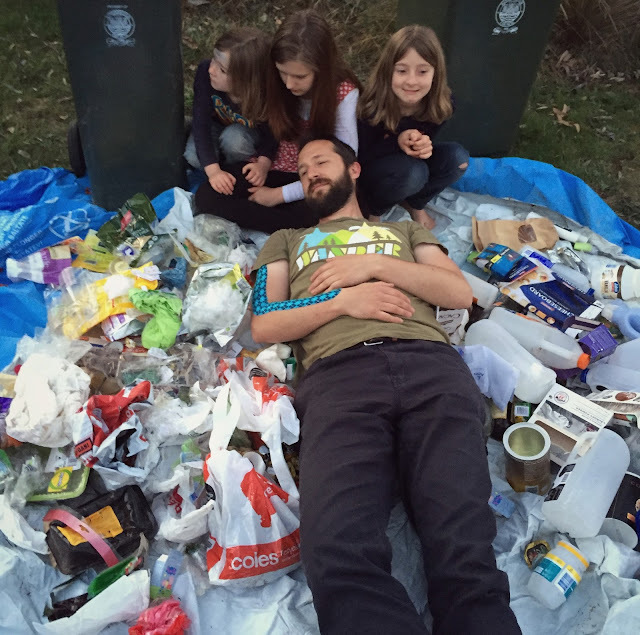 When we lived in Melbourne we didn't use our rubbish bin. It really helped when we transitioned to the country were there are no bin services. I still have a few plastic bags brought into the house (usually by other people) and recycle them at Woolworths or Coles when I go near one of their stores. Did you know you could do this? Have a look. I find it easier now to buy bulk tomatoes and bottle them in glass jars that I can re-use then to take the tins to a tip to recycle. Cuts down on travel but also energy to recycle them. Our ultimate plan is to grow all the tomatoes and our other fruit and veg and meat. We are coming into our first growing season and fingers crossed it is a good one!